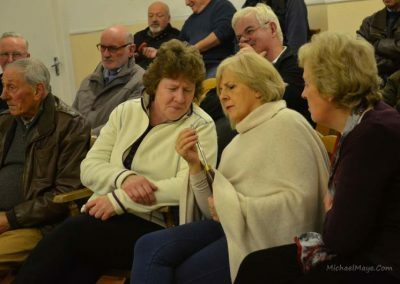 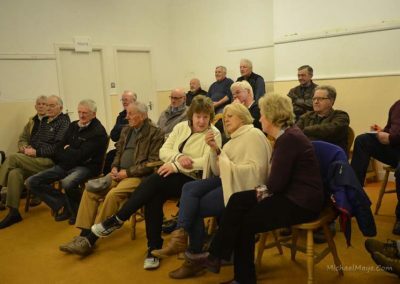 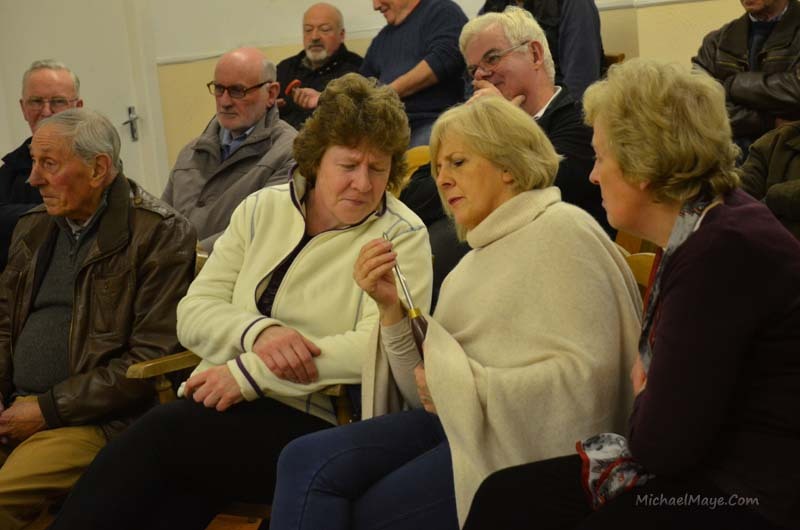 The April meeting of the CraobhEo 2017/18 year took place on Thurs 12th April in the CraobhEo Centre in Aghamore. 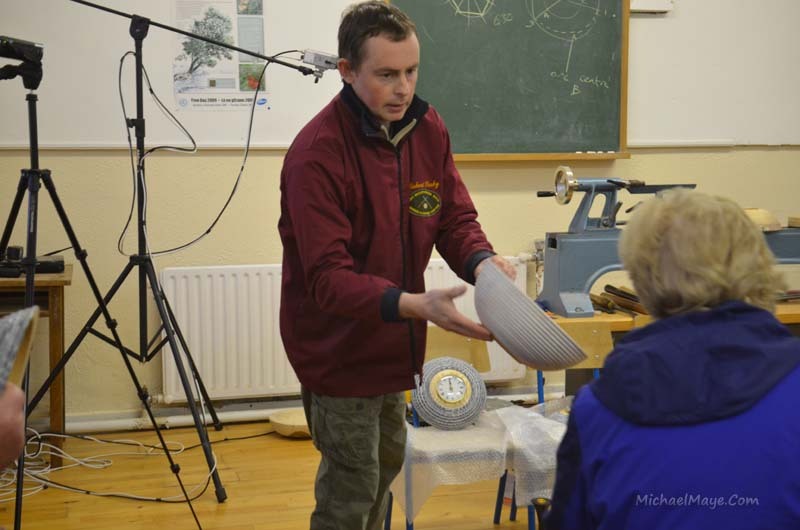 Donal Ryan was our demonstrator for the evening. 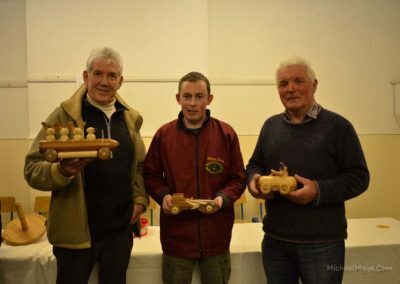 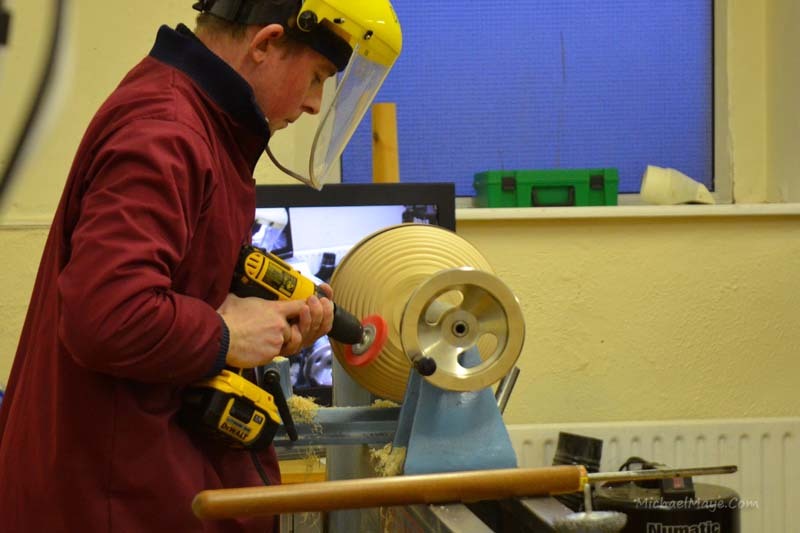 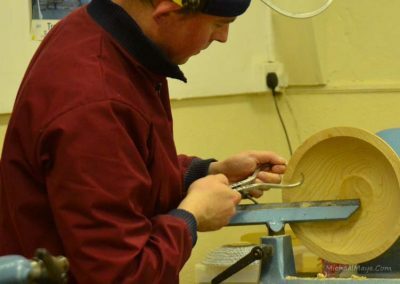 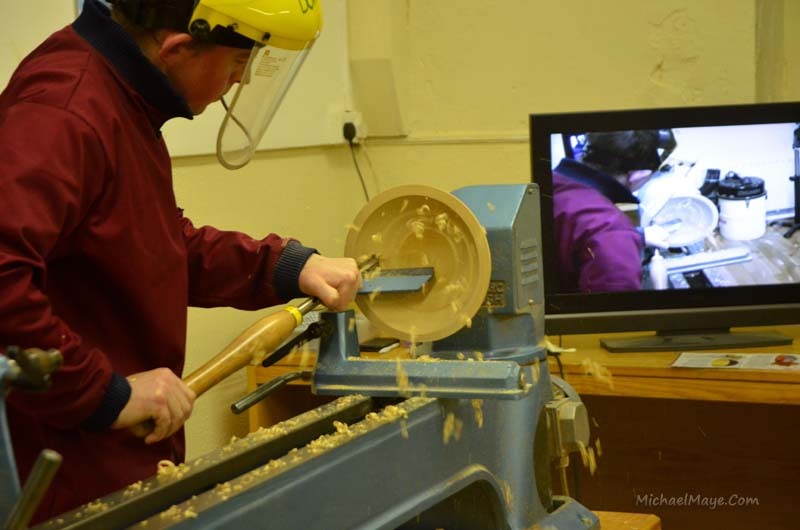 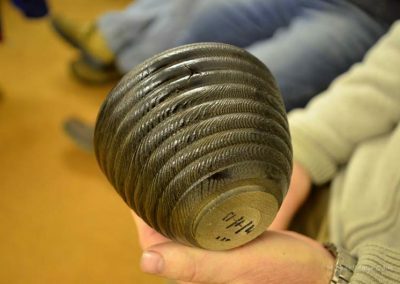 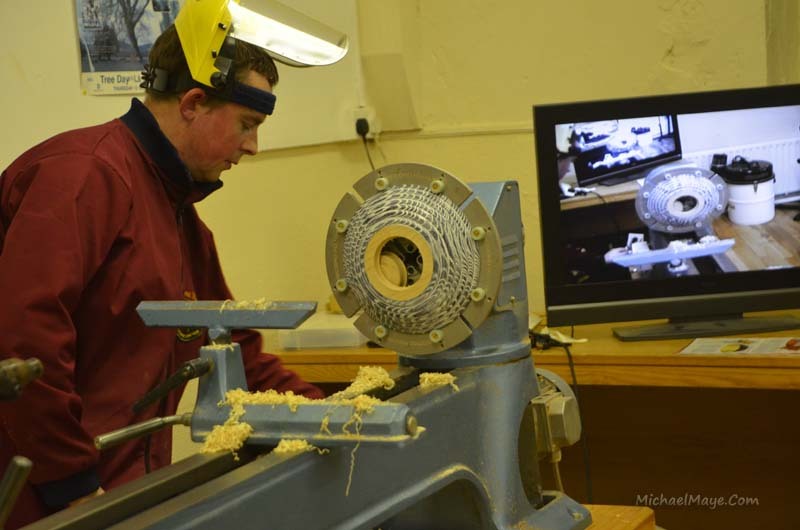 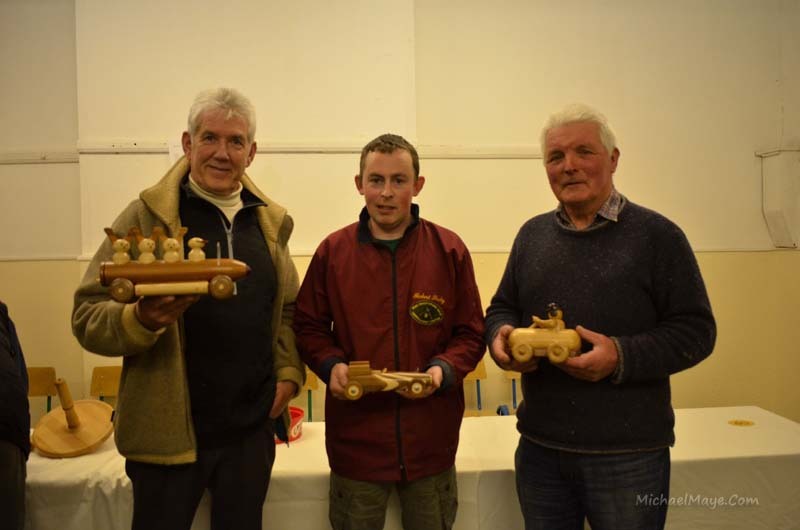 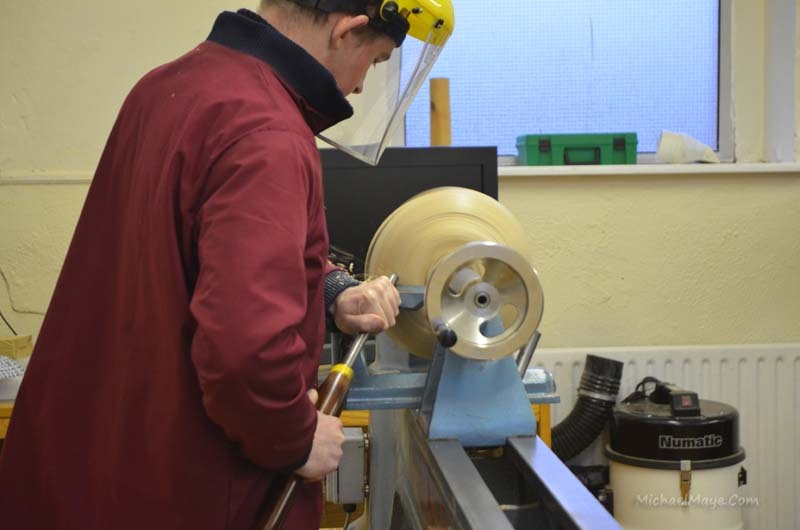 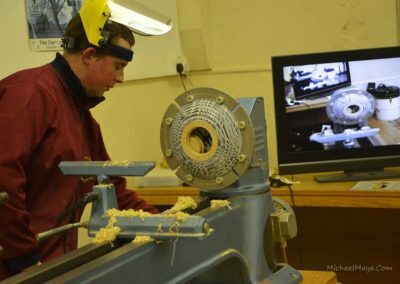 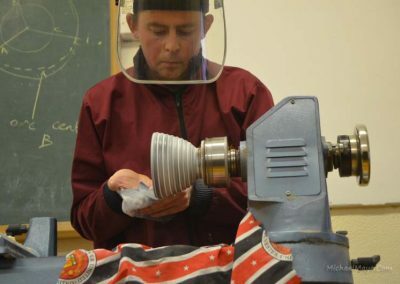 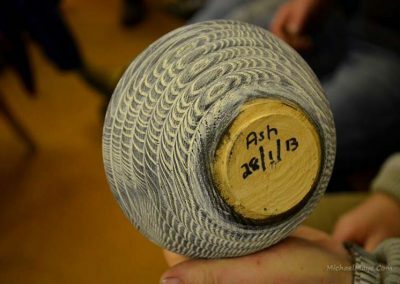 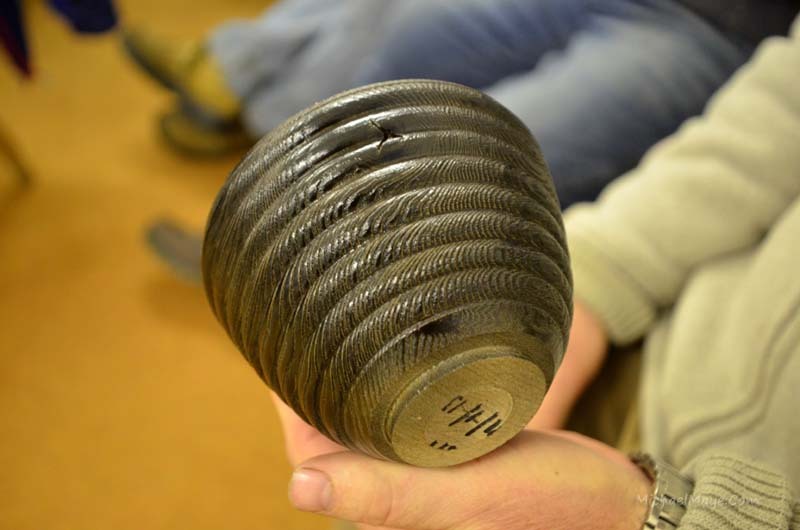 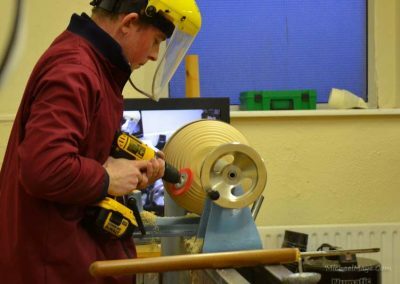 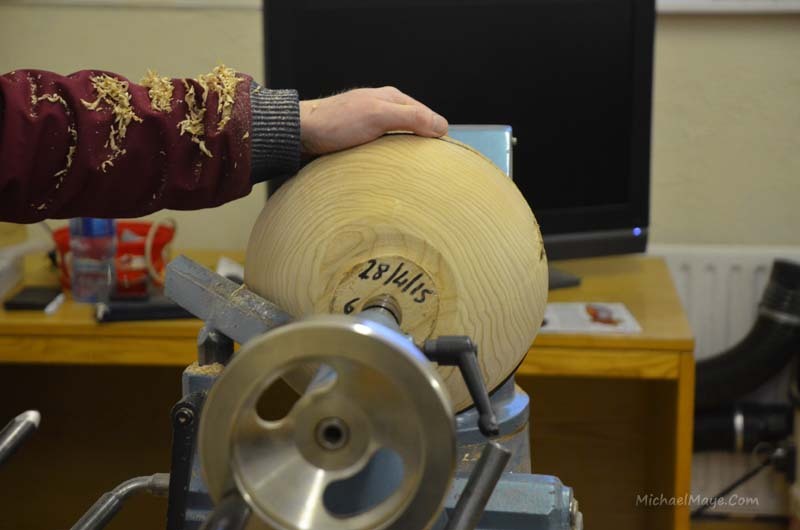 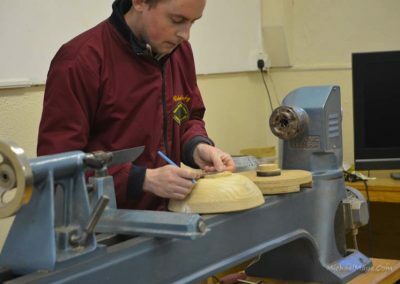 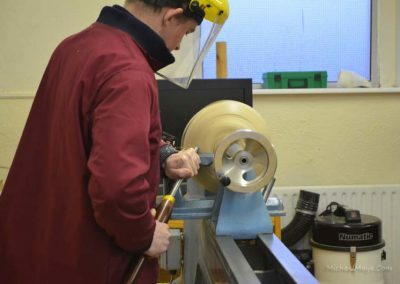 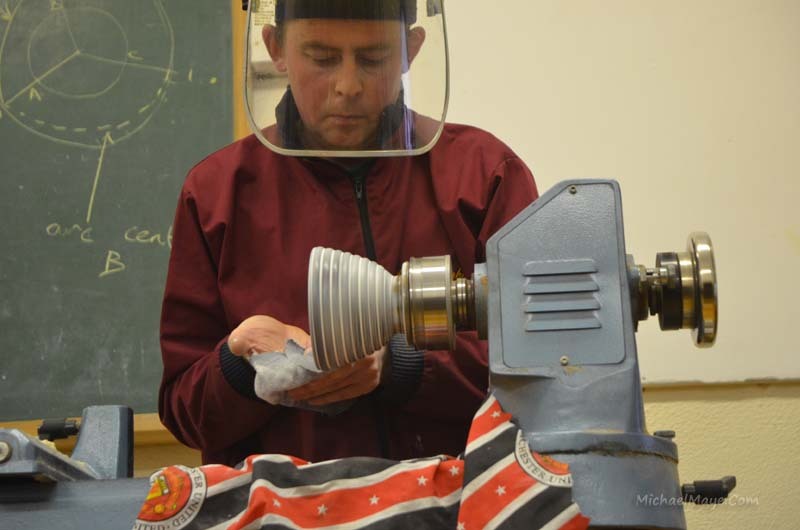 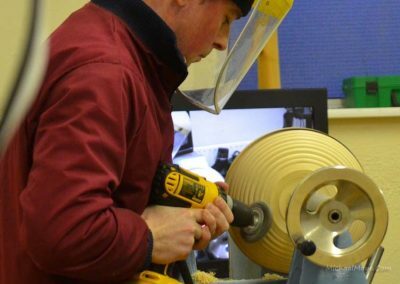 You can view Donal’s woodturning on his website at http://donalryanwoodturning.com/. 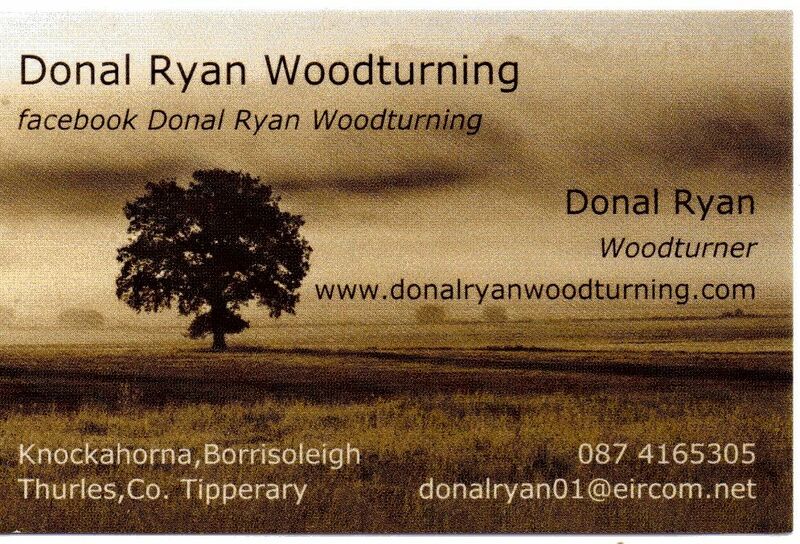 Chairman Mr. Sean Foody welcomed Donal Ryan from Tipperary as our guest demonstrator. 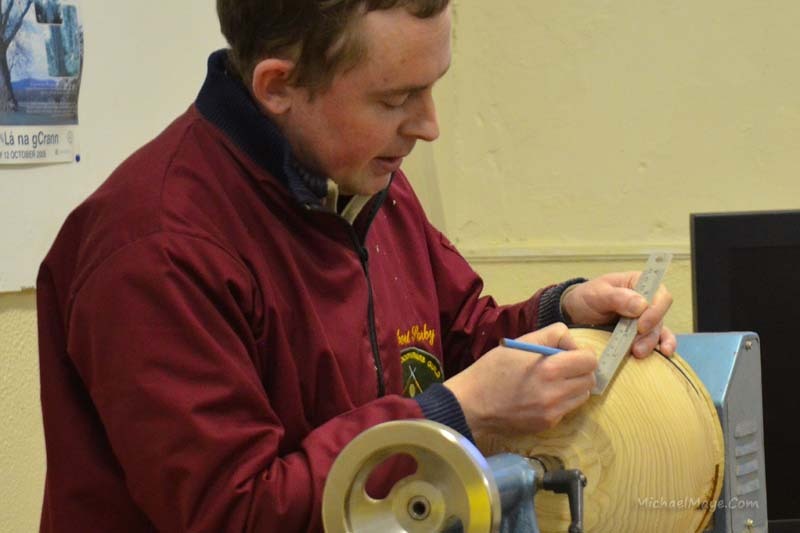 Donal came well equipped with various projects showing texturing, ebonising, liming and gilded effects. 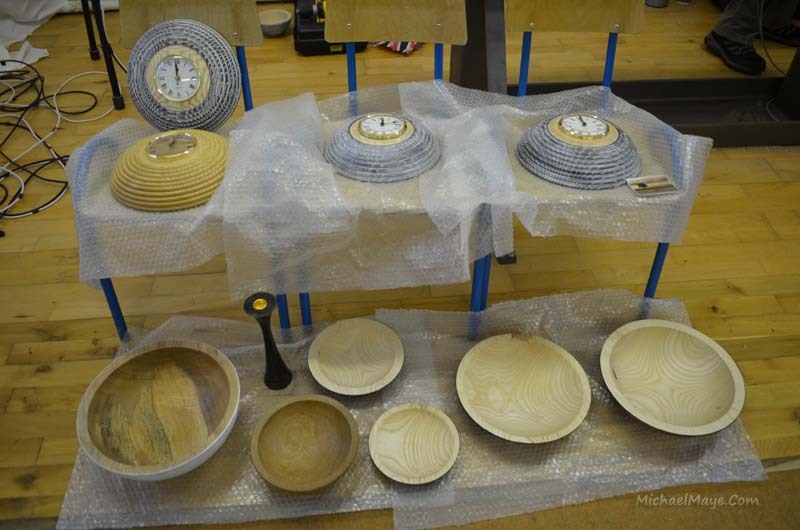 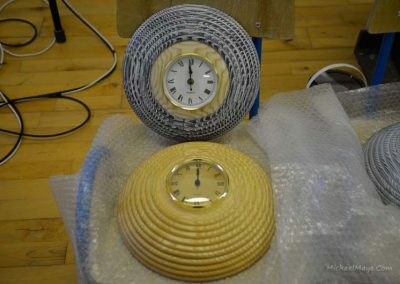 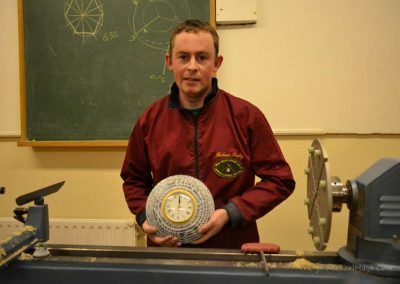 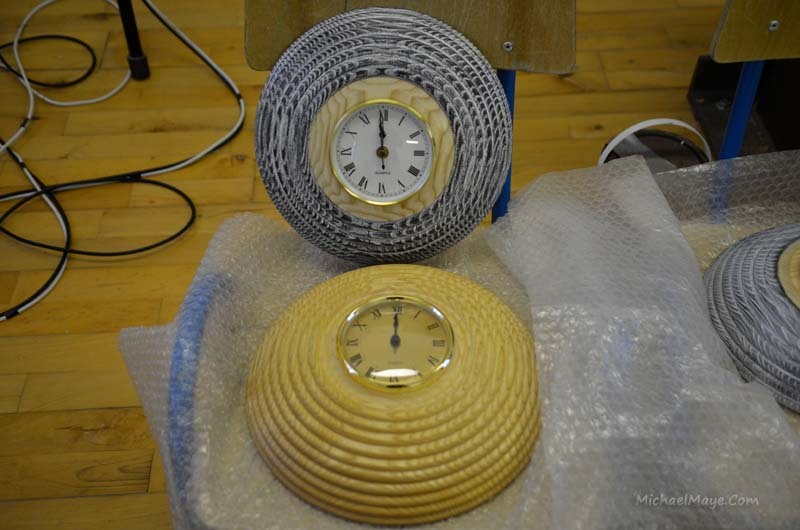 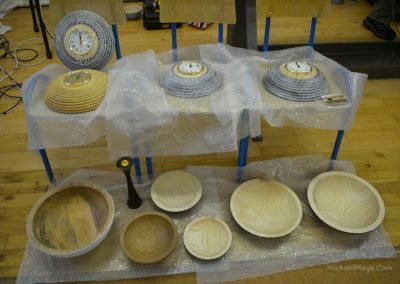 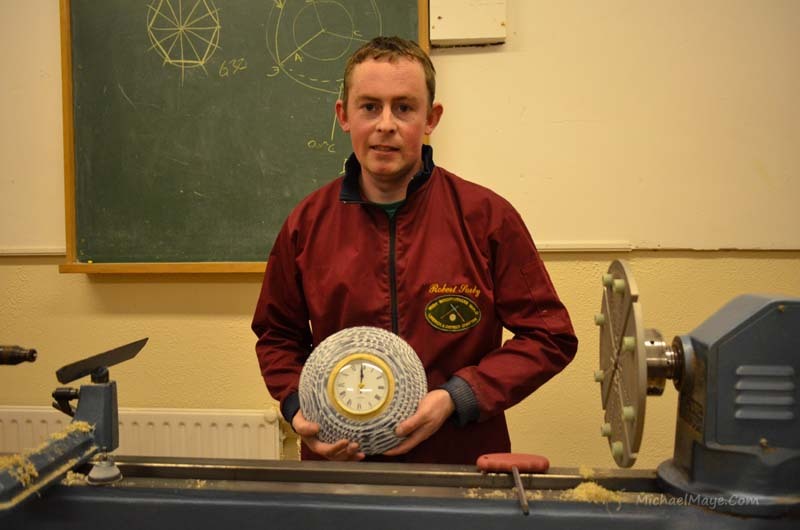 Donal’s project for demonstration was a clock made from Ash in the shape of a bowl with a beading effect on the external wall. 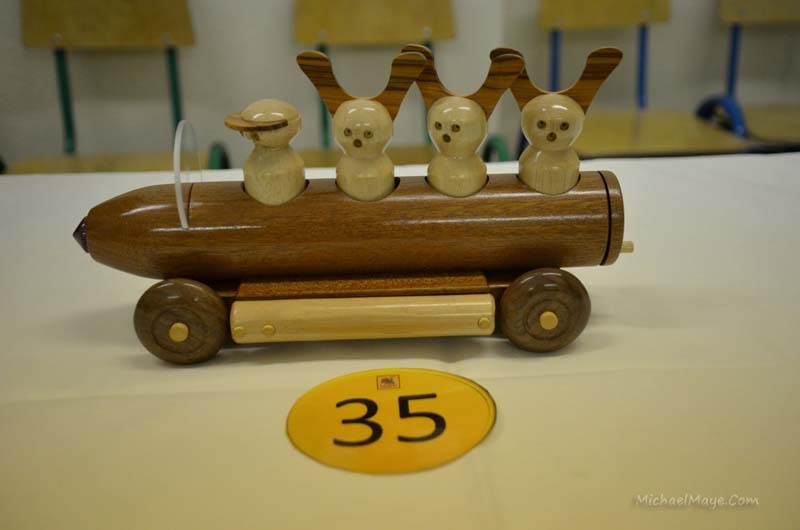 This was then finished with a wood stain and a lime wax also applied. 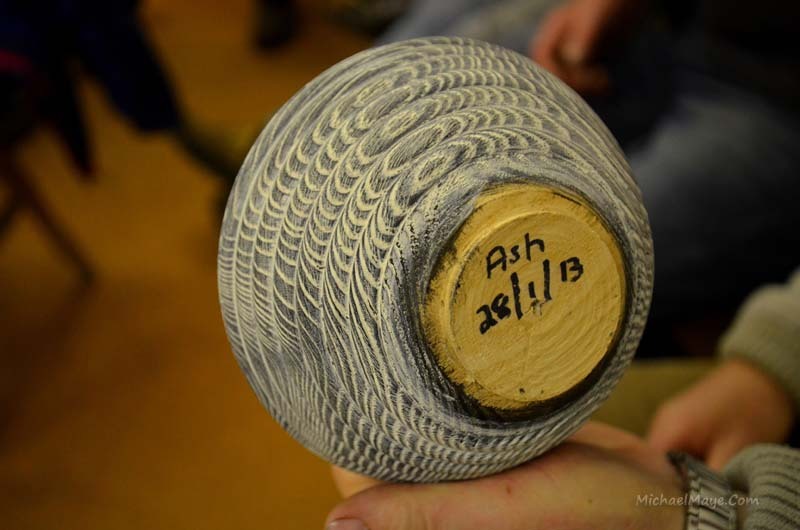 Donal explained that ASH and OAK were the best woods for texturing. Donal came with a rough cut bowl that had been allowed to season for almost 3 years and it was plain to see the distortion on its shape. 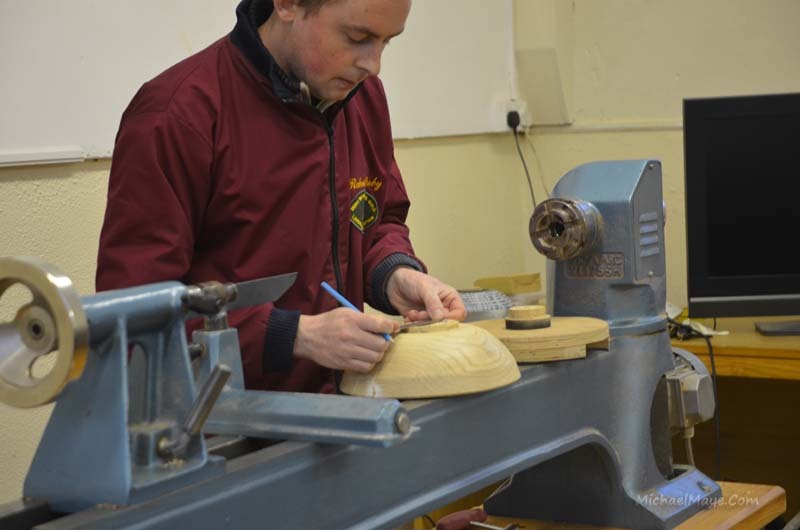 The first job was to true up the external surface of the bowl. 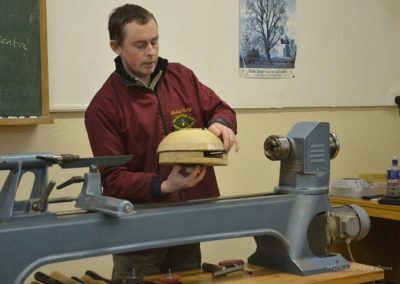 For this Donal showed us a jig he made using the tube of a tyre. 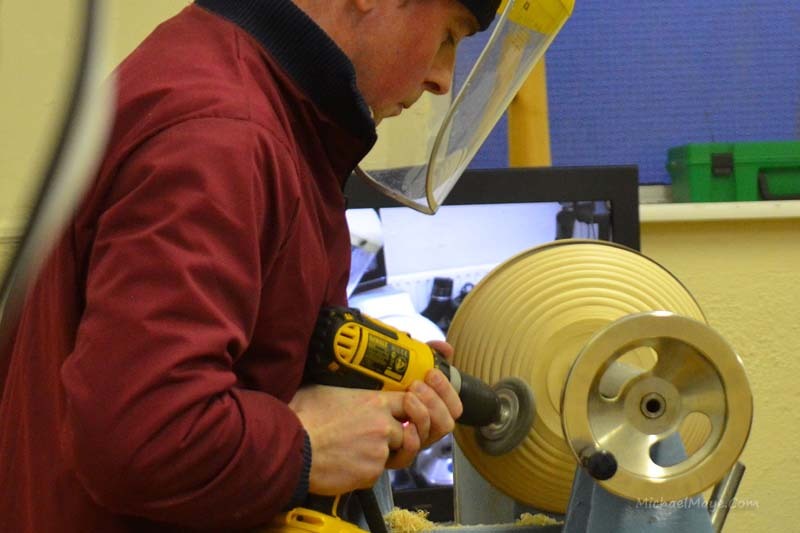 The mouth of the bowl was offered to the tubing and then held in place with the tailstock with a steb drive inserted. 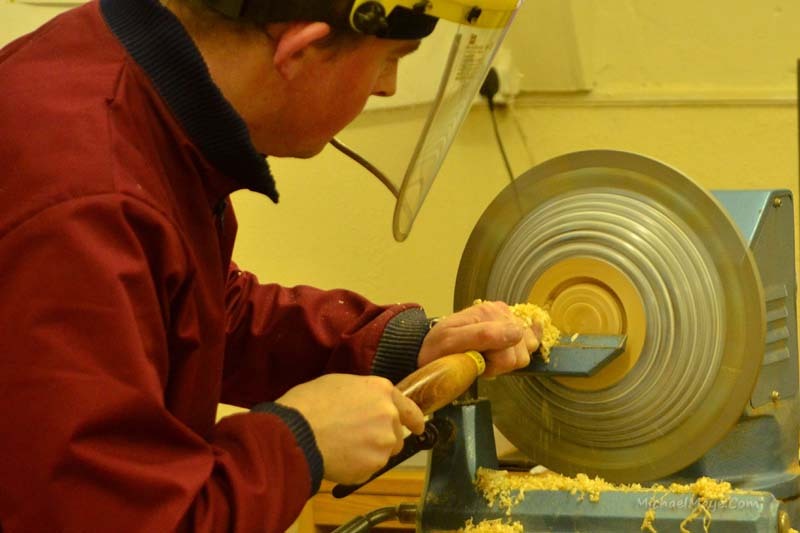 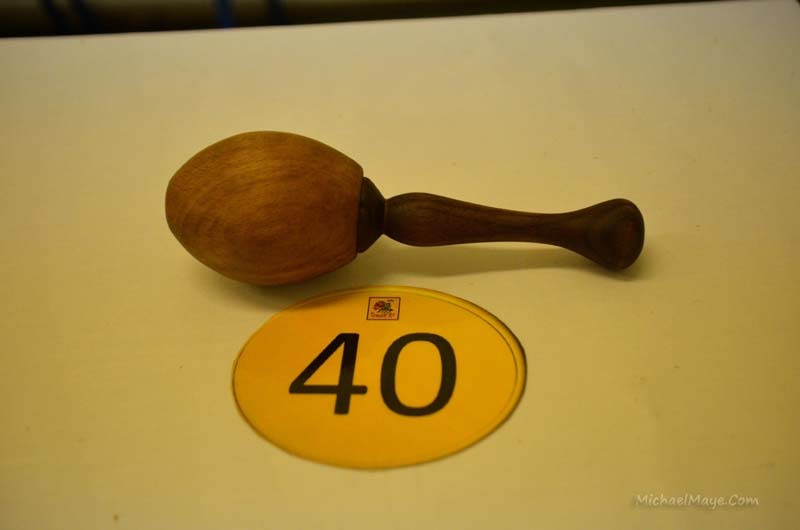 As the bowl was out of shape the speed was increased slowly and using a bowl gouge bevelled at 45 degs. 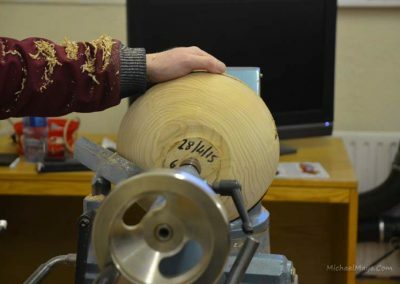 The outer face of the bowl was trued up. Donal explained that he preferred the push cut however the pull cut was equally as good. 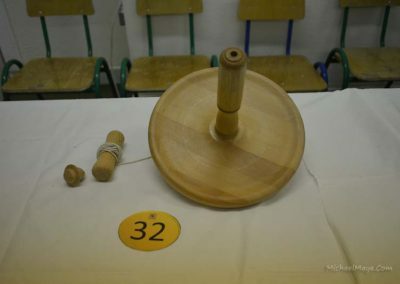 The spigot was then trued up to a dia. 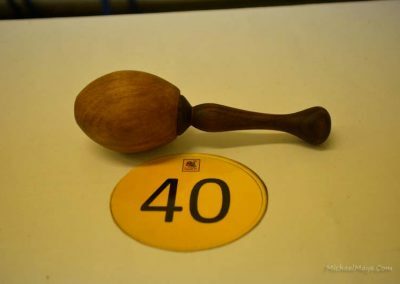 of 50mm. 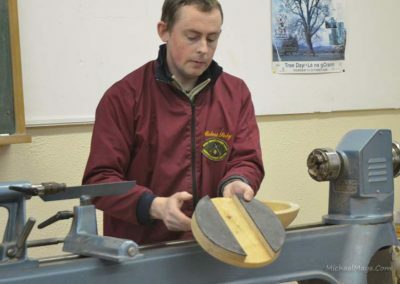 In doing this he used the push cut and dropped the tool rest below centre. The position of the beads were then marked at 10mm centres. 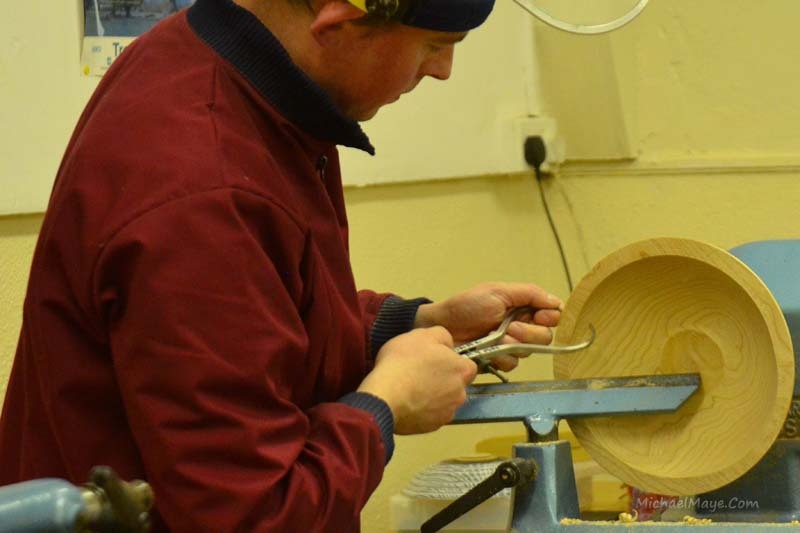 Then using a 10 mm spindle gouge he showed how to create the beads using the pencil marks as the high points of the beads and rolling the gouge to get the desired effect. 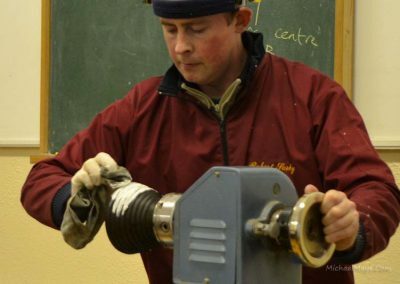 Donal had 2 bevels on his gouge to ensure he got the required depth ion each bead. 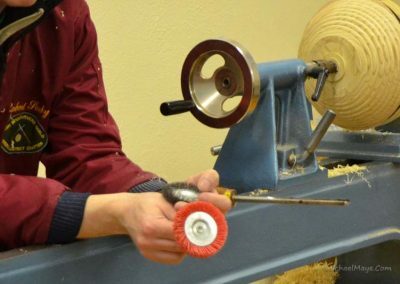 On completing the beads, the top edge and base were cleaned. 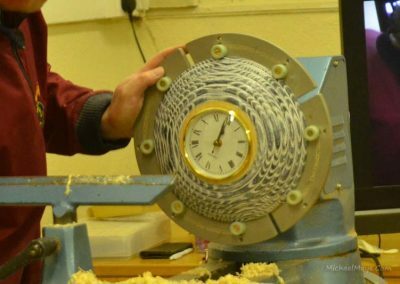 For the texturing effect Donal used a wire brush on a cordless drill. 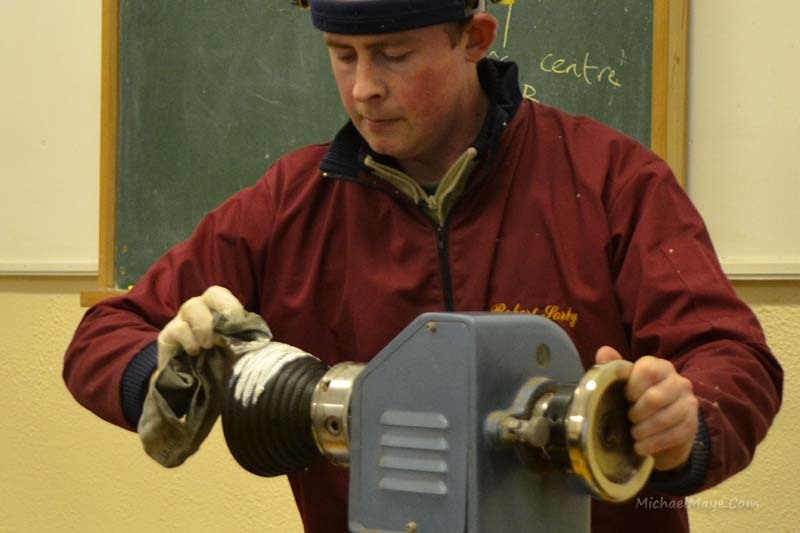 Safety tip was Lathe Forward – Drill Reverse and hold the drill low. 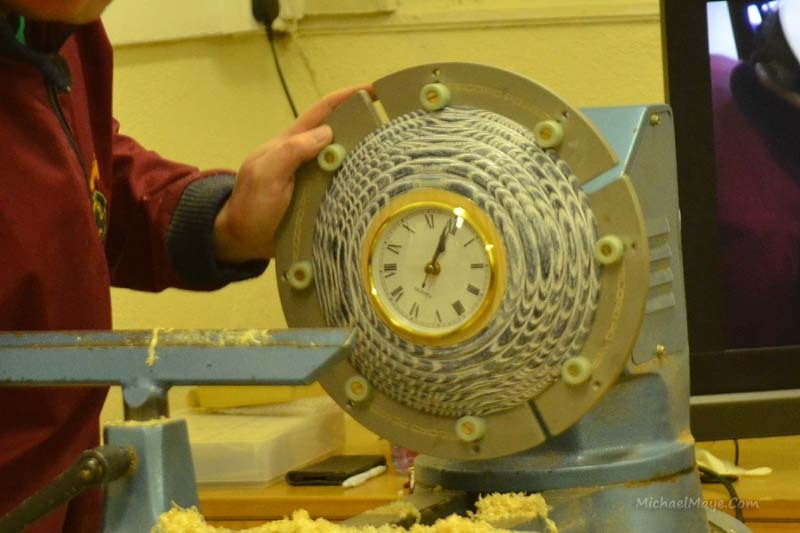 The harder the wood the longer the wire brushing would take. Next Donal remounted the piece on the lathe and he trued up the top edge and then using a 18mm bowl gouge he trued up the internal surface of the bowl using calipers to check the width of the walls of the bowl. 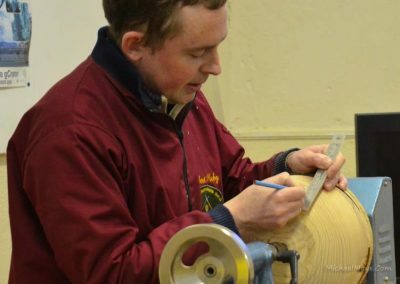 On the base of the bowl on the internal surface Donal marked the diameter of the clock and using a parting tool marked the point by making an incision 2/3 mm deep. 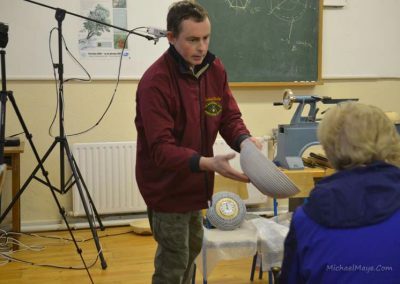 Thanks Donal for your demonstration. 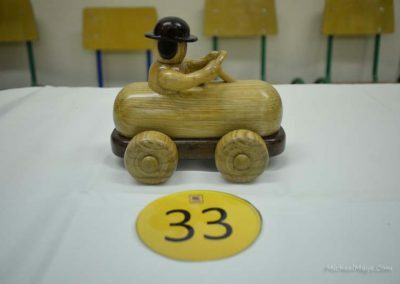 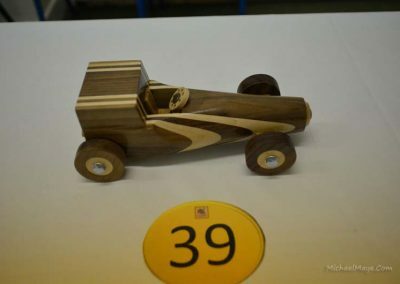 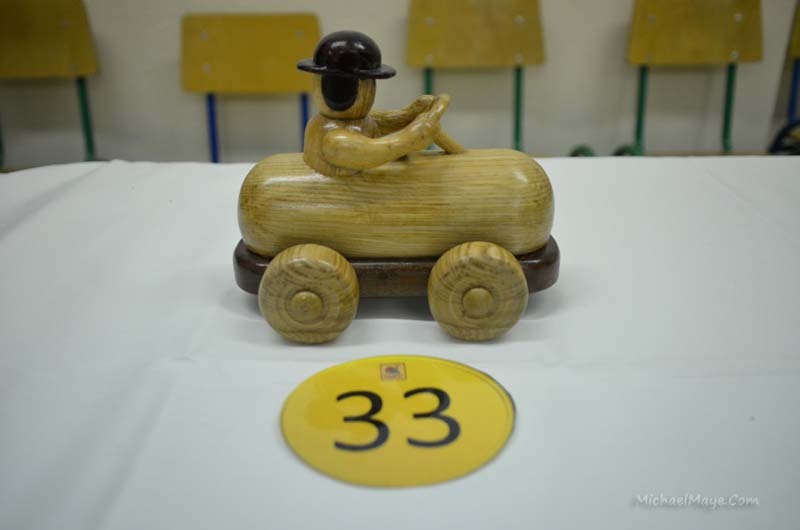 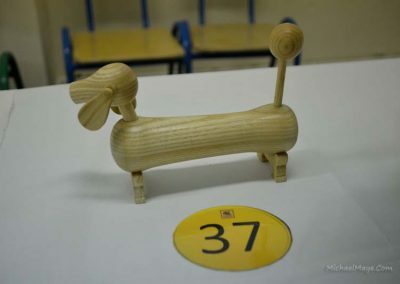 The April competition was a toy. 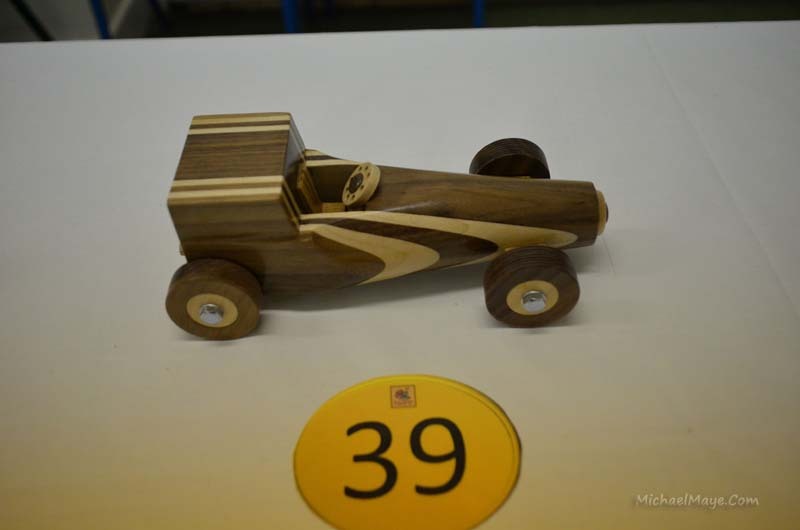 The standard was high and well done to all who submitted a piece. 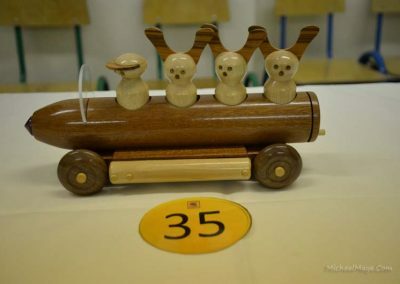 Competition piece for May is a plant stand.